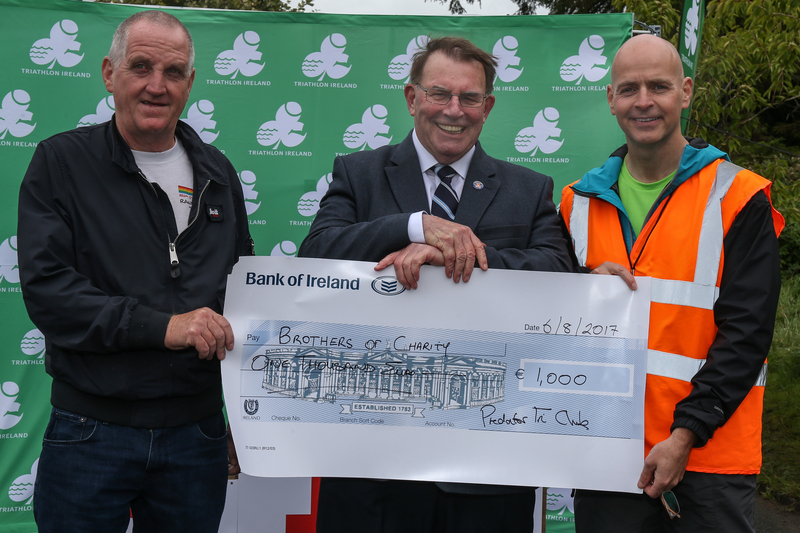 Predator Triathlon Club chairperson, Finbarr Connolly, took time out during their club’s recent successful Loughrea Triathlon Festival to present a cheque for €1,000 to Brother Alfred and Ciaran McGrath from the Brothers of Charity. The cheque will be used to support the work being done by the Brothers of Charity in their foundation in Sri Lanka near the capital city Colombo, where they focus on the care and support of children and adolescents with intellectual disabilities. Predator Triathlon Club have supported this worthy cause for many years now and they continue to strengthen their relationship with the Brothers of Charity in Kilcornan by recently agreeing to lease premises for the use as the club’s headquarters. “We are delighted to present Brother Alfred and Ciaran McGrath with the funds raised by the club, and knowing that it goes to such a great cause is very satisfying,” said Predator Triathlon Club chairperson, Finbarr Connolly. Brother Alfred spoke of the real difference this type of funding will make to the lives of the workers and the clients of their services in Sri Lanka and thanked Predator Triathlon Club for their generosity.